1. 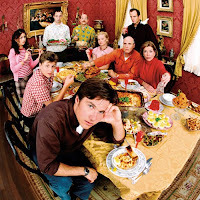 Arrested Development- Not just the best of the decade, but perhaps one of the greatest shows ever made. This mockumentary comedy about Michael Bluth (Jason Bateman), a good man simply trying to bring together his dysfunctional family and failing company, scores from a mixture of ingenious writing, brilliant directing, and a pitch-perfect ensemble. One could attribute this show’s greatness to its ridiculous ensemble of characters, led by Bateman’s straight man. One could also point to its writing, which blends social satire with double entendres. Or one could say it’s both factors, as “Arrested” is a rare show where the stars aligned and everything works out perfectly. The fact that this show was cancelled after only three seasons is an atrocity (hey, I guess it was just too smart for America). However, its future influence is worth more than a million “Two and a Half Men”s. What genius could have invented characters who are nevernudes, alcoholics, and cocky magicians, all in one show? Mitch Hurwitz, that’s who. 2. 30 Rock- Pure comedic bliss. Tina Fey left “Saturday Night Live” and blessed the world with this brilliant showbiz satire. 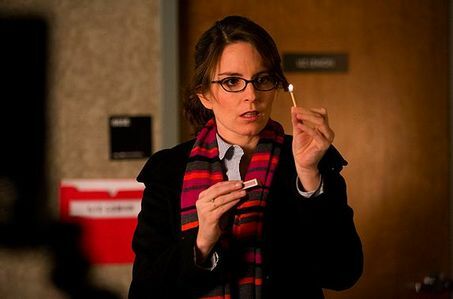 In “30 Rock,” Fey plays the lonely, overworked Liz Lemon, the creator of an NBC sketch comedy show whose world is turned upside down thanks to a pushy new boss (Alec Baldwin). Like “Arrested Development” before it, the show embraces every member of its ensemble (also like “Arrested,” it was in serious danger of cancellation). But what really makes the show tick is its writing, headed by Fey which mixes pop culture references with the weird and the avant garde. 3. Mad Men- The 1960s never looked so vividly alive, and gloriously sinful. This AMC drama portrays the advertising industry in the 60s, through the eyes of the well-spoken, philandering ad man Don Draper (Jon Hamm). “Mad Men” wows for nailing every detail of the time period, from the clothes to the wallpaper. Mainly, it’s incredible that creator Matthew Weiner could spend so much time on style, yet still tell such amazing stories all while keeping the audience attached to such compelling characters. 4. The Colbert Report- It seems rare that an alumni of “The Daily Show” could go off and become just as successful than Jon Stewart. Stephen Colbert is that rare exception. Colbert created a Conservative alter ego and put it on a talk show four nights a week–and it worked. Colbert’s totally deadpan portrayal of a Bill O’Reilly reincarnation is convincing at every turn, from his segments “The Word” to “The Threat Down.” Colbert made America aware of the dangers of bears (“Godless killing machines”), and even saved US Olympic Speed Skating. He even brought his show to the White House, and fooled the president, too. Only someone as brave and brilliant as Colbert could pull this off. 5. Lost- There are two stages of TV drama: before “Lost,” and after “Lost.” “Lost” changed the rules of how time and space work by eliminating both concepts and exploring the infinite abyss of a world in limbo. “Lost” is a modern day “Twilight Zone” for its creative take on the sci-fi genre. However, what truly sets “Lost” apart is its human story. Despite the chaos of its look between fate and freewill through the context of time travel, “Lost” never loses its central theme of being about the little connections that lie between every member of the human race. 6. Planet Earth- Here it is, the best nature documentary ever filmed. “Planet Earth” consists of 11 episodes, each one exploring a different habitat of the earth. What makes this nature show different from every other nature show is that it uses the latest in groundbreaking HD technology. Each image seems so vividly real, that it feels like the action is happening right in your living room. From a shark devouring a seal in slow motion to the rare mating habits of the birds of New Guinea, you’ll never see this planet the same way again. 7. The Office (US)- What we have here is the rare remake that’s actually original. “The Office” managed to take on a life of its own rather than just imitate its predecessor. It helped make the mockumentary sitcom style popular (“Parks & Recreation” and “Modern Family” would later follow). What truly made “The Office” come into its own were its characters, whom the writers made so real by giving them real emotions; they were capable of doing horrible, unforgivable acts and then earning believable redemption. Not to mention, a tour de force in some of the most uncomfortable humor you’ll ever see. 8. It’s Always Sunny in Philadelphia- Some have described this show as “‘Seinfeld’ on crack.” That sounds just about right. “Sunny” follows the lives of five losers who run a bar and in their free time, do horrible, misguided acts in attempts to become successful. Some of these deprived acts include faking handicaps, making terrorist videotapes, and operating secret sweatshops. Oh yeah, did I mention this was a comedy? 9. Curb Your Enthusiasm- If you thought the characters of “Seinfeld” were bad, wait until you meet its creator. “Curb” revolutionized the improv comedy by following the life of the selfish, inconsiderate “Seinfeld” creator Larry David. Just to get an idea of who Larry David is, he once told a teenage girl to “shut the f**k up” and another time tried to dig up his mother’s body and move her into a Jewish cemetery. There are many, many, more horrible things that Larry David has done. And this is all pretty good. Prettaay, prettaay, pretty good. 10. Summer Heights High- It seems that the leading sitcom style of the 2000s was the mockumentary. This Australian import about the lives of a drama teacher, a troublemaker, and an exchange student, is one of the finest examples. Maybe what is funniest about this show is that creator Chris Lilley plays all three of the main characters, even the girl, and makes them seem ridiculous yet endearing. Also, you might quite simply enjoy its hilarious writing, which turned “Puck you miss!” into a national catchphrase. What shows might you include as the best of the decade? This entry was posted in Arrested Development, Quality TV, Top 10, Top 10 of the 2000s, TV of the 2000s on December 28, 2009 by ian0592. Nice post! I love Arrested Development, 30 Rock, The Colbert Report, The Office, and Curb Your Enthusiasm. But I don’t understand why you have Lost on it. Plus, you should have had Modern Family. I don’t realize why you put Scrubs in honorable moments. It’s okay, but not that good.